I’ve been amazed by the fabulous response to the exercise programme we published on Thursday this week – you guys are awesome. I’ve been rather inundated with questions since, so apologies if I haven’t been able to email back right away! The questions that have popped up most often, I’ve answered here (with Matt’s help – he is Mr. Science, after all) – but any others you think of, pop them in the comments below! Should I plan on doing all three steps 3-4 times a week or as needed? If you can, it’s definitely most effective if you can do all three steps as a whole unit. However, if you’re pushed for time – a feeling I know all too well – you might find it easier to spread the walking out over the course of your day. Remember, that whole NEAT thing is, much like Ron Burgundy, kind of a big deal. The more you can increase your activity levels on a general level, the more likely you are to lose weight. I’ve had phases, over the course of the programme, where I’ve been just too busy to get to the gym as much as I’d like. This is where it becomes a psychological thing – because it’d be easy, in times like that, to decide I wasn’t doing it perfectly, so there was no point doing it all, and finding myself at the wrong end of a box of Krispy Kremes. For instance, in August, there was a fortnight where I only managed to make it in four or five times in the course of a fortnight, and I was resting a bad shoulder – so when I was working out, I was skipping the resistance training entirely. What I was doing, however, was walking to and from work, and making the effort to go for a stroll on my lunch break whenever I could. I was eating a lot, but it was all good stuff – so you wouldn’t know I was on a programme at all. In that fortnight, though, I still lost 1.3kg of fat, gained 0.3kg of muscle, and reduced my visceral fat from 7 to 6 (if you can’t remember what each of these is, I’ve talked about them here). All in, I went from 82.2kg to 80.5kg. Now, I appreciate that isn’t a world-changing amount to lose – but given I was only walking, and not for as long or as much as I ought to, it’s still pretty impressive. So just do what you can, and more importantly – think long term. If you only have 3 hours to exercise one week, what do you usually prioritize? Is it better to walk, lift, or do abbreviated versions of both? This is a tricky one, because for the first 20 minutes of your workout, you’ll be burning glycogen, rather than fat. That’s why the duration is important – because it gives your body the chance to settle in, hunker down and get to the fat-burning part. That said, if you are really short on time, I’d suggest doing a 5 minute warm-up, all of the resistance training section (which will take about 10-15 minutes) and then around 40 minutes of fat-burning exercise. The thing about this programme is that you’ll get out of it what you put in. If you can, even just for a few weeks, find the time to do the whole lot, you’ll see results like I have – especially if, like me, you’re multi-tasking your treadmill time. If you’re not able to do that, it’ll still work, but slower – so you may need to be more patient with your results. I live in an extremely rural area and the nearest gym is more than 60 miles away. Walking outside is not too great either when the roads are icy out here in the country. I’m wondering if my Nordic Track XC Skier would be a decent alternative to the walking? I think Matt feels for you on this one – he lives in the middle of nowhere, so most of the exercise he gets over the winter involves chopping logs, chasing chickens, and the like. But I’d say the skier sounds like a great idea! You can do any kind of low-impact cardio exercise in the fat-burning section – I only talk about walking because it’s what floats my boat. 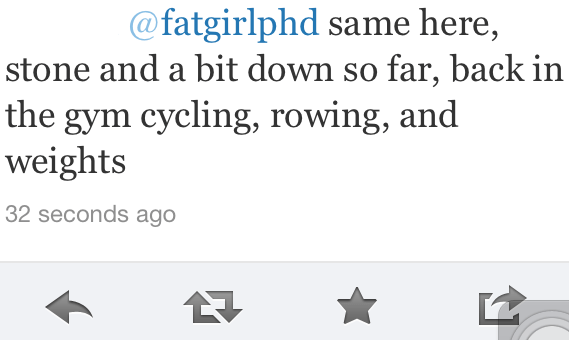 But if you’d rather cycle, swim, use the elliptical machines, dance, or whatever, that’ll work too. It’s just about maintaining your heart rate at that level. So make it your own! In the resistance training part, you said to aim for 3 sets of 8-10 reps per movement. But how many movements total? Or, said another way, how many total sets constitute a “full” resistance workout? And how long does it usually take? A full workout would be three sets of each exercise – with each set made up of 8-10 lifts. So, for instance, I’ll do three sets of ten reps on the chest press, then move on to the shoulder press, where I’ll do three sets of ten again… And so on. I find it takes about 10-15 minutes, depending on how long a rest period I take between each set. And how busy the gym is at any given time! Many of the machines at my gym seem to have faulty heart-rate monitors. Do you use a heart-rate monitor? If so, any recommendations? And… What scale do you use? This isn’t an official endorsement, or any kind of sponsorship deal – but the equipment we’d recommend would be this Polar heart rate monitor, and this Omron BF511 Body Composition Scale. However, you don’t have to invest in a body composition machine so long as you really do understand that your standard bathroom scales might not reflect the progress you’re making, if you’re gaining muscle and losing fat at a similar rate. If you don’t invest in a body composition scale, you should invest some faith in the fact that change will happen. You’ll find your shape, and the way your clothes fit, might change faster than the number on the scales – but that’s why the scales really don’t matter. What’s more important is the fact that you’re taking control, and changing your life – and you’ve got enough trust in your own ability to do that in a healthy way that will help you to lose the weight, and keep it off. So… Good luck! Emotional Eating, Food, Goals, Happiness, Health, Motivation, Nutrition, Psychology, Q&A, Weight Loss, Where Do I Start? I was so, ridiculously cheerful earlier this week that it was almost embarrassing. Honestly, even pre-coffee, I’m pretty sure I had Disney-style bluebirds flying around, singing happy songs about how beautiful the weather is. Even though it’s been raining. I know. It’s gross. But I just can’t help it. I’m happy. And it’s all your fault. I’ve also had a number of emails, tweets, messages and comments of late from people who’ve been reading the blog, and who’ve gone out and lost weight, or changed their attitudes, because of what they’ve read here. I cannot possibly explain how much that blows my mind. Seriously. I’m still amazed anyone’s reading this at all, so… Wow. Just. Wow. So I just wanted to take a quick moment to give everyone here a high-five for massively, massively cheering me up and inspiring me a heck of a lot after a very busy month. You all rock. This blog has been a welcome refuge. Thank you, both of you, for the work you do to demonstrate the importance of nutrition, wellness, and emotional growth. Thank you for confirming that “mistakes” don’t mean failure, and that “success” is little more than a day lived with joy and intention and self-possession. 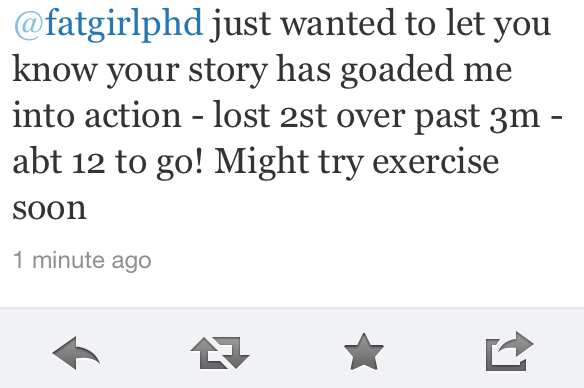 Because that, for me, is what is missing most from weight-loss messages. It’s not just about measurements — it’s about taking ownership of our whole self. This includes an understanding of how food is transubstantiated into flesh (and, often, emotional memory). It necessitates learning how we move through the world. And most of all, it means accepting our bodies as an extension of our wellbeing, not a symptom of our failure or an opponent of reform. Might have got a little bit emotional when I read that. No judging. 2) Some of my favourite tweeps in the world: @emotionalcynic – she is a source of boundless enthusiasm and downright awesomeness. She gets me motivated to go to circuits, which on a chilly night like lasts night is no mean feat. And @ladykalahost, who is a real sweetheart with fantastic advice in the event of a cold! 3) The very lovely Becky, who I met for the first time at the gym this week – she’s been following the programme and just lost 5lbs of fat in a fortnight. ‘Atta girl! Not only that, but on her treadmill at home she’s mastered the art of walking and playing computer games, which makes her – officially – my hero. 4) Ricky, who’s lost more than a stone in just over a month, and will soon be giving Daniel Craig (or Fred Flinstone, apparently) a run for his money. These are just a few of the amazing people I’ve encountered since starting the blog. I can’t include them all because this would start being like an over-long Oscars speech – but honestly, I will never stop being amazed by how great you all are. Seriously. And keep sending me your successes and victories, because the thing is – you’re making it so much easier for me to stay inspired and on track. Ironically, when you’re first starting on a weight loss journey – or indeed any self-improvement, of any kind – it can seem kind of… lonely. It takes a long time to find the things that’ll help you to keep on the straight and narrow, because inspiration is a very personal thing. What inspires you might seem cheesy, or boring, or hard to relate to, for the next person – so there’s no ‘one size fits all’ element to it. Personally, I watched a lot of TV shows about weight loss, and read books, magazines and pretty much everything I could get my hands on in an attempt to track it down when I was first starting out. At that point, I was still trying to figure out what worked for me. Shows like The Biggest Loser and I Used to Be Fat kind of had me torn, because I was inspired by the results, but knew that I just couldn’t take such extreme measures to make that happen. You know, because I have a job and stuff. And diet books just seemed a little bit… Gimmicky. It took me a long time to realise that, as much as these outside sources of inspiration can serve a certain purpose, sometimes you’ve just got to step back from them and turn your gaze the other way. I’m lucky now, in that you guys are constantly inspiring me to do more and be better – but before I had that, I had to look inwards and start generating my own little supply of inspirational juju to draw upon whenever I needed it. I find it’s worth asking myself a few questions, and trying to be totally honest with my answers. Listening to yourself, and understanding what it is that you really want not just right this instant, but long-term, can be really useful in giving you the clarity and focus to get up and get moving. If you can visualise yourself this time next year as a healthy, successful person who is completely in control of your own life, it’s much easier to make the decisions today that will enable you to make that happen. Suddenly, that extra helping of ice cream doesn’t seem quite so essential, because you’re inspired by the potential of Future You. And it’s important to let go of Past You, while you’re at it. When bad things happen in life, it’s easy to dwell on them as things that have hurt, or ‘broken’ you in some way – but you can, and should be inspired by the things in your past – even if they sucked. You’re a good person now, and you’ve got the potential to be a better person in the future, regardless of what’s come before. Time only moves forwards, so it’s worth keeping focused on your own ability to improve, and keep moving onwards and upwards. What I guess I’m saying – in a roundabout way – is that you’ve already got all the inspiration you’ll ever need. All the people I’ve mentioned above (and all those I didn’t mention, too) have managed to look forwards at who they’d like to be, rather than just getting stuck in the ‘now and then’ and made a difference to their own lives. That’s nothing to do with me – and it’s more inspiring to me than any weight loss show, or diet book. You’ve got such a lot of potential, and you don’t need anyone else to help you achieve it – it’s just a matter of being inspired by you. Because you rock. So – how do you get yourself inspired?